On Sunday 26th February the Junior Section will be holding a Junior Section information afternoon. Come and Find out about the 2017 Season for juniors. Come on down and get all your seasons requirements, in terms of club uniform, equipment, mouthguards and 2XU compression equipment taken care of in the one afternoon. All club members are welcome to come and purchase. There will be a free BBQ and the canteen will be open for the purchase of drinks and other items. See you at the club on the Sunday 26 February to ensure any questions you have can be answered in the lead up to the 20167 Hockey Season. At the information day, not only will we have our uniform shop open, together with Hockey Equipe for equipment sales, we will also have 2nd hand hockey gear sales. This is your opportunity, and all proceeds go to the Peter Mac Cancer Foundation. This is how it will work. Bring along those shorts, shoes, hoodie, stick and other hockey goodies that your child has grown out of. All people will then have the chance to buy these donated 2nd hand items for $5. That $5 goes to our Peter Mac fundraising effort. 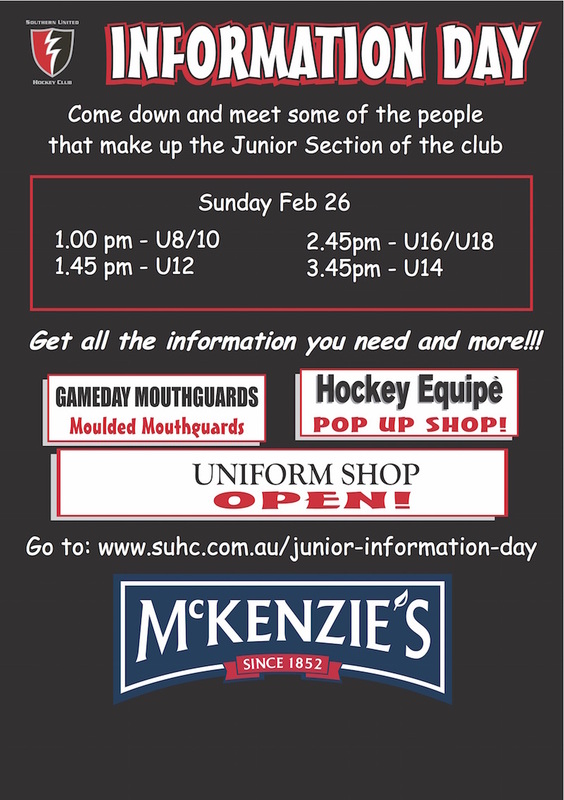 For those attending Southern United Hockey Academy you can bring them then, or bring them to the information day prior to 12.45.